The Feather Tail Glider is the smallest of the gliders with a head and body length of only 6 to 8 centimetres and a weight of just 15 grams. It has a flat feather-like tail, 7 to 8 centimetres long which is used as a rudder for flight and for gripping when landing. The large serrated toe pads enable this small animal to cling to surfaces, no matter how smooth. The soft fur of the Feather Tail Glider is a greyish brown with a creamy coloured abdomen. The gliding membrane stretches along its body from the “elbow” to the “knee” and is fringed with long hair, making for a bigger body surface. The diet of this tiny glider is insects, nectar and pollen. It nests in tall ferns, hollows and even abandoned birds’ nests. The greatest threat to these small mouse- like marsupials is habitat clearing that makes them vulnerable to many dangers. Foxes, feral cats, reptiles and birds such as kookaburras, owls and hawks can deplete the number of gliders that inhabit areas of the Warby Ranges. 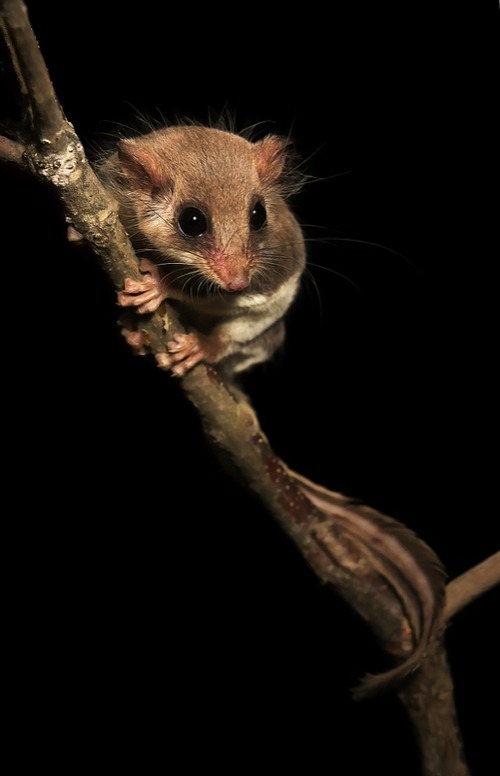 South Wangaratta is home to several species of possums and gliders. The common Brushtail Possum (Trichosurus Vulpecula) and the Ringtail Possum (Pseudocheirus Peregrinus) are well established in the area. Being nocturnal and arboreal and having a diet of nectar, pollen, sap and fruit, etc., make them very adaptable and ensures their continued survival. Less common are the three gliders that can be found in the Warby Ranges. They are, the Sugar Glider (Petaurus Breviceps), the Squirrel Glider (Petaurus Norfolcensis) and the Feather Tail Glider (Acrobates Pygmaeus).